Bromsgrove Concerts, the well-respected regional concert platform, will once again welcome internationally-renowned guest artists in a series of concerts from September 2018 until April 2019, mainly at Artrix. 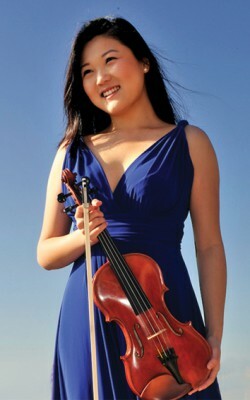 The season opens with a performance by Australian violinist Emily Sun (right), 2017 winner of the Bromsgrove International Young Musicians’ Competition, on Sep 28 in Routh Hall at Bromsgrove School. This year’s programme also features the Atéa Wind Quintet, one of the foremost British wind quintets of their generation, as well as powerhouse ensembles the Piatti String Quartet, the Zelkova String Quartet, the Lawson Piano Trio and the Eblana String Trio. Returning artists include Krysia Osostowicz (violin) and Stephen Stirling (horn), with pianist Michael Dussek joining them to perform as Endymion, and Robert Plane (clarinet) with the Gould Piano Trio. In keeping with the ethos of introducing audiences to unfamiliar contemporary pieces, the new season features works by contemporary composers such as David Matthews, Judith Weir, Joseph Phibbs, Huw Watkins, Mike Mower and Gillian Whitehead. Full information can be found at http://www.bromsgrove-concerts.org.uk and on Twitter and Facebook.